From Missouri to Virginia to Canada, 90 percent of whitetail does will come into estrous and be bred from November 5-20, regardless of moon phase or weather. It’s been that way for decades in the Northern two-thirds of America, and will continue to be that way forever. Take off anytime from Halloween though Thanksgiving, and you’ll hunt some phase of the rut. Anytime you hunt rutting deer you are going to have a good time, with the potential to shoot a big buck. While many hunters and scientists don’t put much stock in the moon’s effects on deer movement, I do. I base this on two things. One, 30-plus years of hunting and observing whitetails as they seek, chase and breed each November. And two, my keen interest in all things lunar, and how the 4 phases might affect deer movement. I read all the moon research I can get my hands, pro and con, and then compare that data to my field notes. The most recent study on the moon and its effects on whitetail movement was conducted several years ago by researchers at North Carolina State University. Researchers tracked GPS-collared deer throughout the lunar phases, and analyzed text messages sent from those collars to determine when the does and bucks moved the most–and the least. I cross-referenced the study’s findings with my field notes and beliefs, and found some similarities and common ground. I’ll use that to make predictions on how and when the deer will move and rut in November 2018. In some moon phases, deer were noticeably more active at dawn than they were at dusk, and the new moon is an example of that. “We saw a large peak of movement at daylight during this (new) phase, and below average movement the rest of the day and night,” Lashley notes. In any given year the first week of November is one of the best times to hunt for a big deer; hundreds of giants are shot this week across North America. If you take off early in November up through the 12th, hunt as long as you can every day, because you never know when you’ll get an opportunity. But remember, with the moon new and dark and waxing crescent, bucks should be most active at daylight. Get on stand extra early and hunt the mornings extra hard. This is where I disagree. Looking back to my notes, it is no secret that many huge bucks are killed every year during the rut window of November 8-16. This is always a good week to take off work. On and around November 10 every season, especially in the Midwest, the “lockdown” begins in many areas as mature bucks hole up in covers and tend and breed does. Couple that with the data that say the overall deer activity will diminish during the first-quarter moon this November and things could be tough in some areas. But again, it’s the rut, and a big buck is apt to make a mistake anytime, any day. If this is the week you can get off work, go for it. For several years I’ve been developing a new moon theory—mature bucks move great during the day in and around a full moon in November. Of course this flies in the face of what most of you have read and been told for years and probably believe–that deer are most active at night during a big moon, and therefore the full moon is bad for hunting. But I believe I’m on to something, because the more I hunt during the “rutting moon” across the U.S. and Canada, the more bucks I see wandering around the woods, or chasing does. The NC study backs me up, at least somewhat. “A common misconception is that deer can see better at night (and hence move all over the place) because it’s brighter when the moon is full. But according to our data they actually move less on average at night during a full moon and more during the middle of the day, and also earlier in the evenings,” Lashley says. I see things setting up to be pretty good during the moon that waxes full on November 23, especially in states like Tennessee, Virginia, Oklahoma, Montana and others where peak rut typically occurs later on in November, from the 17th or so and throughout Thanksgiving week and even into early December. 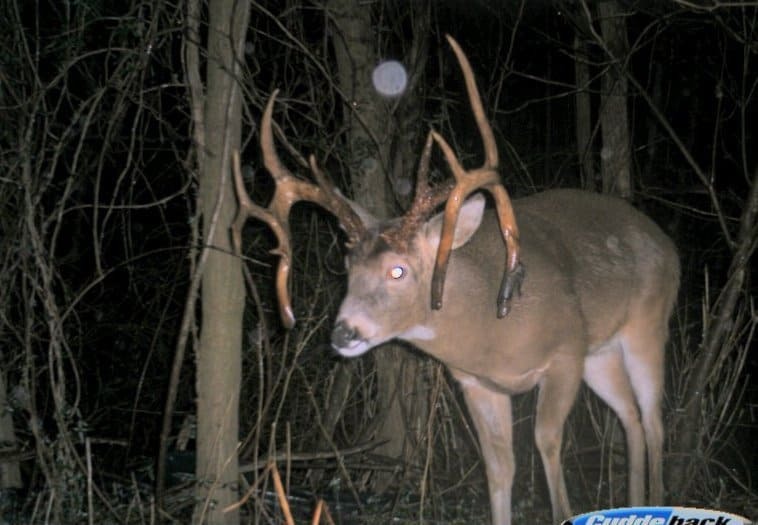 And in Midwest states where old bucks will be coming out of lockdown, some of them will prowl long and hard from around 11:00 a.m. until dark each day as they search for more does. Plan to get on stand by 9:00 a.m. and hunt till dark. Later on in November is tough and unpredictable any season. Breeding is winding down, and bucks have been pressured by hunters for two months. Simple math says there are fewer bucks in the woods because some were harvested earlier in the season. Try this. Set an afternoon stand near a secluded, thick-cover funnel that leads out to a crop field where you know does are feeding. A skittish, weary buck is still ready and willing to breed any last doe that will give him a chance. You might shoot one yet as he sneaks out to check the girls in the last wisps of light. Good luck and let me know how you do moon-wise. This entry was posted in Big Bucks, Big Deer TV, BigDeer, Deer Hunting, whitetail deer by admin. Bookmark the permalink.